Weaving in and out of the rocks and inlets and surrounded by majestic pines lies the ribbon of real estate known as Alaska’s inside passage. Though this is a part of the country most have never seen, it may be the United States finest for natural beauty. One of the interesting features of the inside passage is that all the waters that make up this coastline are fed by the Pacific Ocean. Because of that the waters are salty, deep, and full of marine wildlife not found in your local reservoir or stream. Orca and porpoise greet travelers most mornings in the passage, reminding you that you certainly aren’t in Kansas anymore. In some ways, we need this reminder. We need this reminder because even though we are surrounded by pine trees and grizzly bears, the water is amazingly calm. In fact, the water is like glass at times . . . you could even ski on it if you wanted to! This calm water does not look like any picture of the Pacific Ocean I have ever seen. 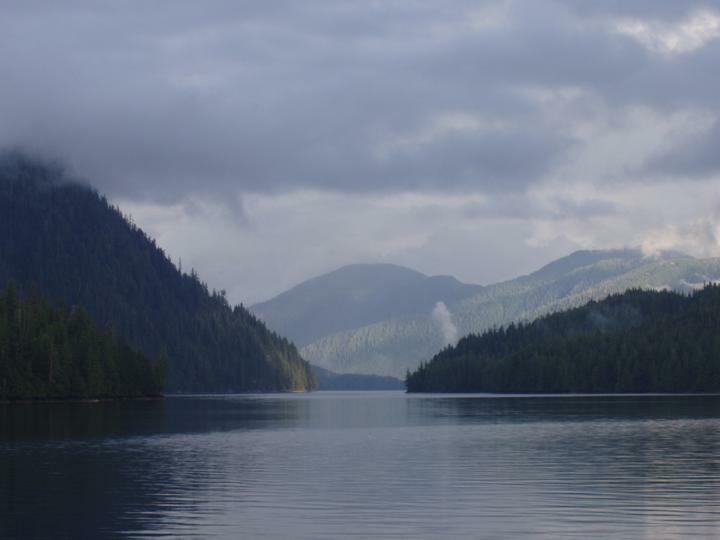 So what causes the water to be so calm in the inside passage? The water is calm in this area in places like Yes Bay, Alaska because the rocks of the outside shore line have blocked these harbors from the crushing blows of the waves that are present on the open sea. A few years ago I got to go to Yes Bay for four days of fishing and fun with a set of friends. While we were fishing there, we quickly learned the difference between the protected waters of Yes Bay and the rough waters of the open sea. Each morning, we would hop on our boats and cruise around Yes Bay to drop down shrimp pods and crab traps. This was a relatively easy job, and on the gentle waters of the bay, we walked freely around our little boat to move the ropes and pulleys in order to accomplish our job. After a few minutes setting these traps, however, we would head out to different locations to fish for salmon. En route to these other locations, we would drive across the open sea. The moment our boat left the comfort of our protected bay, we would all sit down and hang on. The waves in this section battered the boat each day, and the roar of their power made it impossible to have even a conversation with the one sitting next to you. It was amazing to know that this was the same body of water, so smooth in one location and so bumpy in the next. Isn’t life like that? Our lives are lived on a “body of water” that is smooth at times and rough at others. In a world this unpredictable and violent, how can we stand firm and move around freely without fear of being thrown out of the boat? In response to these questions, Romans 5:1-2 gives us some great insight. This passage talks about how those who have placed their faith in Jesus Christ have gained access into grace. This is a strange choice of wording because as it is phrased, it sounds as though grace is a place. What can it mean that we have gained access into grace? To better understand this idea, it is important for us to look at the original meaning behind the phrase translated above “gained access into.” The original word here was used often in nautical settings to refer to a boat being granted access to enter the safe and secure waters of a protected harbor. In a sense, the word could be used to accurately describe the transition from the rough waters on the open Pacific to the protected glassy waters of Yes Bay. What I think this passage is trying to tell us is that because of what Jesus Christ has done for us, we get to live our lives perpetually in the protected sphere (or realm) of God’s grace. But what does this mean? This realm of God’s grace is a place we can now “stand” in according to Romans 5:2. The picture this conjures up for me is the image of the ease and confidence we had to put out the crab traps and shrimp pods in Yes Bay. The stability of the boat caused us to be able to stand and do what we needed to do without fear of being rocked over the side of the boat. The grace of God is a lot like that. For believers in Jesus Christ, living in the sphere of God’s grace gives us the confidence to live our lives out by faith without fear of God rocking us over the side of the boat if we screw something up! We are in the protected waters perpetually. Now this does not mean that there will not be difficult things that will crash into our lives as we progress in this world, but it does mean that we are secure in Christ as those waves come our way, so we can stand confidently in the midst of life’s chaos. The inside passage to peace with God is protected by the Rock of our salvation. The crushing blows of the waves of life cannot throw us off the boat when we are standing in the sphere of His grace. This Sunday at Wildwood, we will be continuing our series entitled, “ABC’s of Faith.” In this, our third week of the series, we will look at Romans 5:1-11. Join us this week as we see what the realm of God’s grace and mercy means for those of us who live by faith. See you Sunday in either our 8:15, 9:30, or 11:00 service!